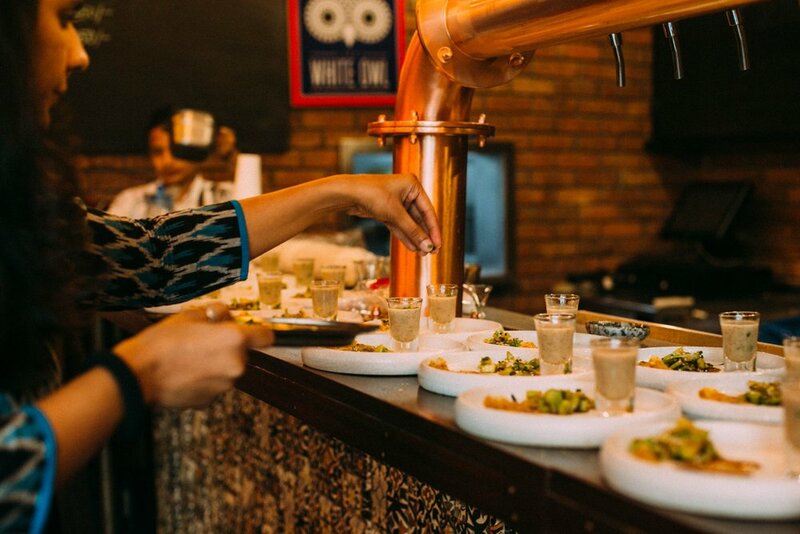 This interactive workshop curated by Goya Media at The Smoke Co. Bangalore, featured chef & mixologist Arina Suchde who advocates for better food choices through sustainable and all-natural practices in the kitchen and bar. Sharing her expertise on cooking root-to-shoot, and eating ethically sourced foods, Arina demonstrated 5 recipes made entirely of 'waste' kitchen ingredients, such as peels, seeds, stems and rinds. The workshop was ticketed on Insider.in and participants got to sample all of Arina's delicious creations, as well recipes to recreate these dishes at home. This time, the much-coveted Goya Goody Bag featured products that shared the themes of sustainability and ethical foods. We are so proud to partner with these brands and their products: apple cider vinegar by Conscious Foods, curating organic and natural Indian foods; millet chocolate pancake mix by Slurrp Farms, a brand founded by two incredible women promoting forgotten, healthy foods and recipes for the future; Black Baza Coffee, an organisation that works at the grassroots with small farmers in Karnataka; and jars of Rock Bee Honey from another Goya favourite, Timbaktu Organic. More pictures up on Facebook.